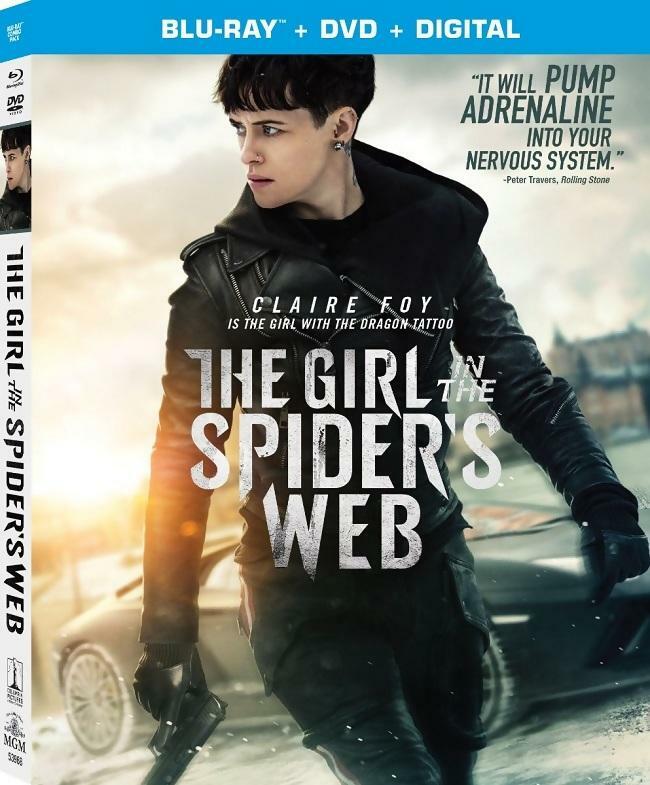 That pesky hacker vigilante gal with a dragon tat on her back is now The Girl in the Spider's Web with an unfortunately underwhelming Claire Foy filling in for Rooney Mara and Noomi Rapace with a plot that's half The Net and half 007 Spectre. Sony Pictures delivers a beautiful looking 1080p Blu-ray for North American markets with a terrific transfer, a strong DTS-HD MA 5.1 mix, and a decent assortment of bonus features. For escapist entertainment, Spider's Web isn't the worst, but it's not special either. Worth A Look. "Secrets of the Salander Sisters"
"Creating the World: The Making Of"
Hacker and righter of wrongs, defender of abused women, Lisbeth Salander (Claire Foy) has been keeping a low profile by kicking the rich abusive asses of various bad men and dumping their vast fortunes to their wives and mistresses whilst making headlines in newspapers and radio. Because of her low profile and obvious anonymity in Stockholm's underground, brilliant defense-systems programmer Frans Balder (Stephen Merchant) turns to Salander to retrieve the computer program he created for the Americans that controls every country's arsenal of nuclear weapons! 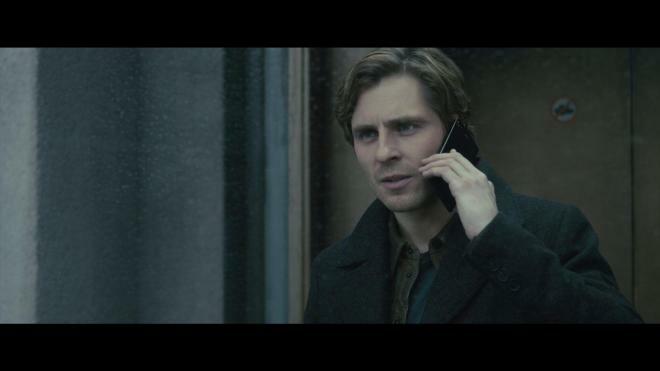 But when the program is stolen from Lisbeth by a shadow network, she must turn to her trusty buddy journalist Mikael Blomkvist to help solve the mystery - one that leads Lisbeth entirely too close to her tortured homelife for comfort. Apparently very loosely based on David Lagercrantz's follow-up fourth novel of Stieg Larsson's original Millennium Trilogy, The Girl in the Spider's Web is an oddly Cherry Vanilla Coke rendition of Lisbeth Salander. I didn't read the fourth novel - same as I didn't read any of the followup Godfather or Bourne books written after the passing of the original authors. While I'm sure some may be worth reading, they're ultimately a cash-grab designed to wrench and wrangle $$$ out of fans. Spider's Web is most certainly that. This film is clearly designed to appease fans of Fincher's 2011 Girl with the Dragon Tattoo who wanted a sequel while also catering to fans of the original Swedish 2009 films. The only problem is this film can't match the energy of the original 2009 films nor the dour and grisly nature of the 2011 film. After seeing what she can do on The Crown and films like First Man and Unsane, Clair Foy is more than capable of delivering a dynamic performance and would have made a great Lisbeth Salander. Unfortunately - and it's even mentioned in this disc's bonus features - there was a push to lighten this film and more or less make it "accessible." When you're telling a story of a deeply scarred and abused woman who confronts abusers and beats the crap out of them while systematically (and rightfully) destroying their lives as she gets caught up in an even larger more dangerous plot, "accessible" isn't appropriate for a movie like this. Foy isn't given any meaty material beyond dying her hair black and adding a piercing or two to her nose and ears to define herself as Lisbeth. 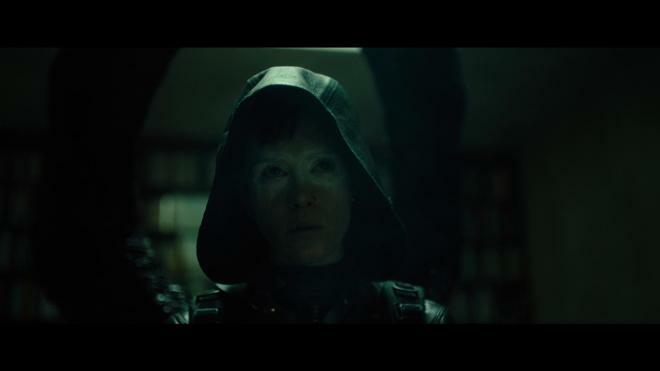 This design and intention to make the film more "user-friendly" leaves director Fed Alvarez and his co-screenwriters Jay Basu and Steven Knight with little room to explore Lisbeth's character or her world beyond what amounts to a rehash of Spectre complete with a stupidly conceived super weapon and an evil shadow intelligence network willing to do anything to get it that is also conveniently a part of our hero's sad and sordid past. Toss in goofy techno-thrills from The Net and you have Spider's Web. Considering Alvarez's track record with dark and grim features such as Don't Breathe and Evil Dead, one would expect some of that natural darkness to seep into the film somewhere - but Spider's Web is pretty tepid material. 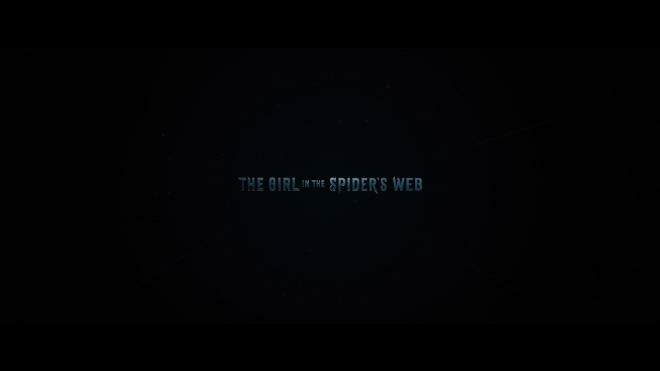 If you're fine with the movie just being a pulpy silly spy-thriller with some rough plot contrivances, an over-abundance of convenience buttressed by some great action sequences, then I'll admit that The Girl in the Spider's Web is entertaining. But it's not impressive. This movie could have been anything but a Lisbeth Salander film and been just fine. As it is, it's a tame callback to the 2009 films and a sad reminder that Fincher won't get to finish the great work he started with the 2011 remake. The Girl in the Spider's Web arrives on Blu-ray courtesy of Sony Pictures in a two-disc Blu-ray + DVD + Digital set. Pressed onto a BD-50 disc, the disc is housed in a standard snapper Blu-ray case with identical slipcover artwork. The disc loads to trailers for other Sony horror/thriller releases and then segues to a bizarre pseudo advertisement encouraging you to keep watching after the movie for bonus features like it was a late-run VHS tape before arriving at a static image main menu with traditional navigation options. It's unfortunate that The Girl in the Spider's Web isn't making landfall on 4K UHD Blu-ray stateside. Sourced from a 4K Digital Intermediate, this 2.39:1 1080p transfer is a terrific showcase example demo disc that could only potentially be improved by an HDR 4K UHD presentation. Details are exquisite. The art direction for this film is phenomenal with every location steeped in tiny details that ooze foreboding and dread. Facial features, makeup work, locations, and set design all come through with terrific clarity. In keeping with the series' standards, this is a dark and moody show with a great thematic contrast between light and dark that comes through beautifully. Black levels are deep and inky with plenty of shadows and without any crush issues. Whites are bright and crisp while avoiding blooming. Colors are naturally subdued here favoring darker grays/browns/and olive-toned greens, but primaries do get their day in the sun. Red is an especially important color for one character and comes through beautifully. Without any sign of noise or pesky banding, this is a damn fine Blu-ray presentation. The Girl in the Spider's Web arrives with a decent English DTS-HD MA 5.1 mix that's pretty much par for the course for an average action/thriller. Dialogue is clean and clear throughout - even through some pretty thick fake euro accents. Sound effects are well spaced and give the mix a lot of life and activity - especially in the quiet tense moments. The opening scene with the young Salander sisters playing chess, there are some small but notable sound effects that give great object placement and help boost atmospherics. The moody and effective score by Roque Baños punches the mix with some low LFE tones. Levels are spot on. I'd love to hear a Dolby Atmos or DTS:X track for this film, but this 5.1 mix is solid stuff. While Spider's Web may have been a bit of a critical and box office letdown, Sony delivers a disc that offers up a pretty decent look at the making of the film. Alvarez offers another great commentary track as he goes into a nice amount of detail about making the film and his choices with the material. The making of featurettes are pretty standard EPK stuff, but there are some good lengthy topical segments that offer an interesting look at why this story was chosen to be filmed instead of continuing on with Fincher's vision. The deleted scenes aren't earth shattering but they'd have helped ease some of the criticism of the film's reliance on convenience. Audio Commentary Track featuring director Fede Alvarez and co-writer Jay Basu. The Girl in the Spider's Web should just about be the nail in the coffin for the cinematic adventures of Lisbeth Salander until it's eventually rejiggered as a television series for a streaming network. Neither a sequel to Fincher's film nor a true direct continuation of the original 2009 Swedish trilogy, Spider's Web suffers from a lack of direction and a behind-the-scenes miscalculation to soften the film's image and become more of a super-spy action movie instead of a dark and personal thriller. Clair Foy could have been a great new Lisbeth Salander - had the material allowed her to fully become the character. It's entertaining in a pulpy way, but fans may be left out in the bitter Sweedish cold. Sony Pictures delivers a technically first-rate Blu-ray into the Spider's Web. Sporting a gorgeous 1080p transfer, a solid audio mix, and a decent assortment of bonus features, the only complaint about this disc is that there isn't a 4K UHD Blu-ray release for the North American market unless you buy digital only or import it. As it is, The Girl in the Spider's Web is Worth A Look.